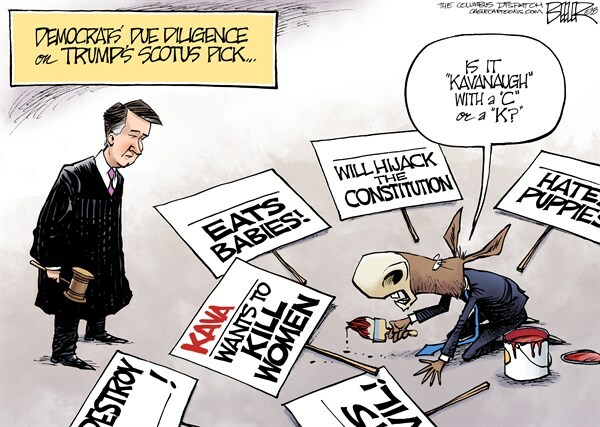 President Trump's nomination of Brett Kavanaugh to fill the vacancy left by retiring Supreme Court Justice Anthony Kennedy has predictably produced apoplexy on the left. Their certainty — and outrage — that one man will have the power to dispense rights they view to be nonexistent, and dispense with others they consider inalienable, only shores up a fact that the left will almost never admit: the federal government has far too much power. While politicians on the right certainly can wield excessive power just as oppressively as leftists can, traditionally it has been conservative Republicans and Libertarians calling for smaller government as a matter of constitutional principle, while liberal and progressive Democrats argue that more government is the appropriate solution to every problem. However, big government is apparently fine for Democrats only as long Democrats run the government. When Republicans control the levers of power — not so much. The contraposition of the Obama and Trump administrations demonstrates the hypocrisy and deliberate blindness of the left when it comes to the threat of overweening government power. Democrats loved it when President Barack "I've got a pen and I've got a phone" Obama utilized executive orders to achieve policy objectives they wanted, like Obama's DACA order on immigration. But faced with President Trump's ability to exercise that same power (even if just to undo Obama's orders), they scream "Fascism!" The problem isn't Obama or Trump per se; it is an executive branch that increasingly exceeds the constitutional limits of its power, and usurps that of Congress.